Over the past few weeks, I’ve been taking a look at each position Michigan has been recruiting and which recruit could possibly fill the needed spots. In the last installment of our 2016 recruiting preview, I’ll be taking a look at a position Michigan currently has good depth at- Cornerbacks/Safeties. Who is Michigan Targeting in the Defensive Backfield in 2016? Heading into the 2015 season, Michigan currently has 15 players listed on the depth chart as a defensive back. In my opinion, this is by far the position with the most depth on the entire roster, and it may take a backseat in this year’s recruiting. In Michigan’s 2015 recruiting class, they brought in two new defensive backs in S Tyree Kinnel and CB Keith Washington. With only five seniors listed on the depth chart in the defensive backfield, the chance for playing time could come as early as next season. 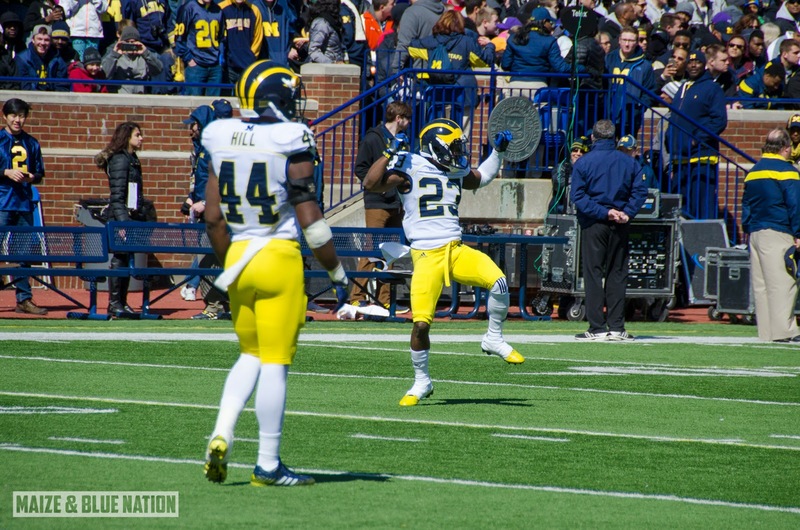 So, who is Michigan targeting at cornerback and safety in 2016? David’s high school highlight film is filled with very impressive plays, from both sides of the ball. Whether he’s lining up as a Wide Receiver, or as a Cornerback, David is constantly making plays. Although he can play both sides, I think his future is on the defensive side of the ball. David is an excellent cover cornerback. He has the necessary speed and agility to keep up with receivers 1on1. He has great back pedal speed and can turn his hips quick enough to not lose a step with his man. Since he’s already played as a receiver for his Loyola High School squad, he already has the ball skills that go along with a quality defensive back. David also has good size to play the cornerback position, standing at 6’0 and weighing 175 lbs. David plays as a pure "ball-hawk" and anytime the ball is thrown his way, the chance of an interception is very real. He has very long arms which he takes full advantage of when breaking up passes. David surely projects to be a multi-year starter at the collegiate level. David is ranked as a four star recruit and the #30 ATH in 2016 according to Rivals. He holds scholarship offers from; Arizona, Arizona State, Duke, Miami, Oklahoma, Oregon, UCLA, Utah, and Washington. On Wednesday Coach Zordich paid David a visit at his high school. Like Lamar Jackson, JJ is a new name to the Michigan recruiting board, as he was offered in mid-February. In my opinion, JJ will make an excellent safety at the college level. He has great size (6’2- 170 lbs. ), to go along with excellent speed and ball skills. While he will most definitely have add on some additional muscle mass once he arrives in college, JJ already plays like a college safety. He’s has above average field vision and has a knack of knowing where the ball is going to be thrown. Effective during blitzes due to his speed, and is able to get around the edge quickly to get to the ball carrier. Does a good job of letting the play develop in front of him and then breaking towards the ball. Good hands and is able to high point balls for tips or interceptions. Sheds blocks with relative ease and is a decent tackler. Good lateral agility and can turn his hips quickly without losing much speed. JJ is ranked as a three star prospect and the #31 overall safety in 2016 according to Rivals. At the moment he holds a small but respectable offer sheet including schools such as; Arizona State, Duke, Louisville, Michigan State, North Carolina State, Virginia Tech, and West Virginia. CJ is a prospect the coaching staff has identified early on as a recruit that they would love to have on their team. While it’s still ten months away from NSD 2016, Michigan looks to be in the thick of CJ’s recruitment and it should come down to a battle of USC/Michigan for his services. CJ is a force in the defensive backfield for his Junipero Serra High School squad. He plays with a high level of intensity and is constantly zipping back and forth across the field. CJ could line up anywhere in the defensive backfield in his collegiate career, but I like him more as a free safety. CJ does an excellent job of keeping the play in front of him and is rarely ever beaten in 1on1 situations. He breaks to the ball extremely quick and does a more than adequate job of tackling. Possesses good size to match up with receivers, but like most high school defensive backs, will have to add on some additional weight. Good instincts and almost seems to know which side of the field the ball will be going on. Attacks the ball quickly and flies through the box to make tackles. Wherever CJ ends up playing his collegiate career, he could see early playing time as a punt/kick returner, as his elusiveness when he has the ball in his hands is too good to keep him on the bench. CJ is ranked as a four star prospect and the #19 safety in the 2016 recruiting class according to Rivals. He has scholarship offers from; Arizona State, Cal, Duke, Illinois, Oregon, Oregon State, USC, and Wisconsin. Coach Zordich also visited CJ at his high school on Wednesday. Lamar is a new name to the Michigan recruiting board as he was offered a scholarship by the coaching staff in late February. While Lamar saw playing time at running back last season, Michigan will be recruiting him as a defensive back. Lamar is a very intriguing prospect as he has all the tools that coaches look for in an every down corner. His speed is what makes him so elusive on the playing field, as he is able to keep up with the other team’s top receivers. He has excellent ball skills and is constantly in the thick of the play. Since Lamar has played running back in his career, he already possesses excellent hands and ball skills. Lamar is more than likely a project as a defensive back, but I wouldn’t be surprised to see him start out as a nickelback early in his collegiate career, and progress into a starter later on. Lamar is ranked as a three star recruit according to Rivals. His scholarship offer list features mostly Pac-12 schools such as; Arizona State, Cal, Colorado, UCLA, USC, and Washington. Lavert is a name that has been on Michigan’s board for a while now, as he has been offered by both Brady Hoke and Jim Harbaugh. At the beginning of his recruitment, it looked as if Michigan would be the front runner for his services, but after a horrid 2014 season, Lavert has looked elsewhere and committed to Penn State on January 31st. Lavert is a “do it all” type cornerback. He can play man to man coverage extremely well, or can drop back into zone coverage. After watching his film, I truly believe that Lavert will be one of the top cornerbacks in college in a few years. He has a good blend of size, speed, and field vision, which makes him so dangerous in the defensive secondary. Possesses excellent back pedal speed and locks on to his receiver from the moment the ball is snapped. Has quick hips, and is able to turn around without dropping his speed. Good ball skills and is constantly attacking the ball. Breaks to the ball quickly and can guard almost any receiver on the field. An excellent tackler, who rarely has tackles broken. Does a good job of getting low on the ball carrier and wrapping up his man. Lavert is ranked as a four star recruit and the #19 cornerback in 2016 according to Rivals. He holds a small but impressive scholarship offer list including schools such as; Miami, North Carolina, Ohio State, Tennessee, and North Carolina State. A few months ago, I would have put Michigan’s chances at flipping Lavert’s commitment at slim-to-none, but after a quiet visit last month, the possibility of Jim Harbaugh flipping the four star recruit is very possible. Note- List is in order of likeliness to commit, not based upon rankings. 2016 Kicker Quinn Nordin visited Ann Arbor on Wednesday. Quinn is ranked as the #1 Kicker in 2016 according to Korn Blue Kicking. 2017 Cass Tech ATH Jaylen Kelly-Powell picked up a scholarship offer from Pitt on Tuesday. 2016 TE target Kaden Smith committed to Stanford on Tuesday afternoon. 2017 RB target Najee Harris won MVP at the CenCal Passing Down Elite 7on7 tournament in Sacramento last weekend. 2016 OT target Frank Martin III committed to USC on Thursday morning. Frank released a Top 10 list which included Michigan earlier in the week. 2016 DE target Julian Okwara committed to Notre Dame on Wednesday. 2016 LB target Caleb Kelly released his Top 10 schools last Saturday; which included Michigan. 2017 RB target Todd Sibley Jr. will be in Columbus this weekend for Ohio States Spring Game.